“Hi Maria – just wanted to share a progress update! I’m 3 weeks in. I’m 15 lbs down. I’ve also started working out. Before your plan I would eat half a Luna bar and down a whole 5 hour energy before working out. My energy level would fluctuate wildly during my workout and I would often have to eat these sugar blocks to have enough energy to lift weights after doing cardio. I would come home dragging and starving. Since your plan I’ve been working out on an empty stomach with just my morning supplements (L-carnitine, magnesium, and L-tyrosine) and my workouts have been great! I have consistent energy all the way through and I’m not even really that hungry for breakfast when I get home – but I do eat! Because my energy is consistent I also feel like I can push and challenge myself more during my workout. I’m excited to see how my weight loss gets even better with my workouts! Preheat oven to 350 degrees F. In a large bowl, mix the dry ingredients together. Stir in the wet ingredients into the dry ingredients. 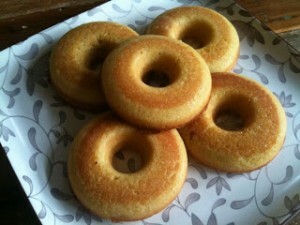 Fill greased donut pan circles about 2/3 of the way full with batter. Bake for about 20 minutes, or until a toothpick comes out clean. Toasted coconut topping: Toast some unsweetened coconut flakes for about 5 minutes at 300 degrees F. Dip each donut in sugar-free pancake syrup and then in the toasted coconut. Serves 8. Does Truvia come in bulk or do you use many, many little packets to reach the 1/2 cup? 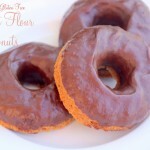 Do you think this would work if I made the recipe in muffin tins instead of the donut pan? I really want to make these but don’t want to wait until mine comes in the mail! A coffee cake sounds absolutely delicious! Do you have a recipe? No sugar free syrup available where I am… What else could I use? Honey is pretty high GI although when raw has many healing properties… Do you think dipping in stevia sweetened melted coconut oil would work? Have you tried these with peanut butter? Stevia sweetened coconut would probably taste awesome! I haven’t tried peanut butter but I’m sure it would be great! Thanks! I may have to try them both… very soon ;). I’m also wondering, all your recipes look absolutely delicious, especially all your healthy cookies and cakes and donuts and candy bars… etc. How much of these healthy treats should a person be eating? Or how much can we incorporate these delectable treasures into our daily diet? Honestly, my clients enjoy these treats everyday and STILL lose weight! I got a donut pan today!!! I’m so excited!!! I’m going to try this recipe! I need to start your blog at post #1 and read everything!!! These look delicious!!! I love that this recipe is so full of eggs. How nutritious! Hello there – finally had an opportunity to make these bad boys! I halved the recipe and this nicely filled up a six hole donut cake tin.They rose beautifully, and are sitting the fridge now overnight for some sugar free syrup or vanilla and some coconut. I am working my way through your recipes, and will admit to being tempted to buy a dutch pancake appliance just to make your jam filled donuts. I have resisted the temptation so far, as I know I would make them every single day. Thanks for all your hard work in making these recipes. Ugh. 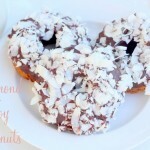 I want to make these right now but dont have coconut extract. I may sub. Vanilla, think that’s ok? Maria – you say everything is better as a donut. Made these in the churro maker my son received for Christmas. We know think everything is better as a Churro! Nice texture, dense and flavorful. Yum! I made this into a coffee cake with a coconut glaze and it was fantastic. I can’t tell you what a treat it was to enjoy a slice with my tea in the mornings. Thank you so much for all your hard work Maria. 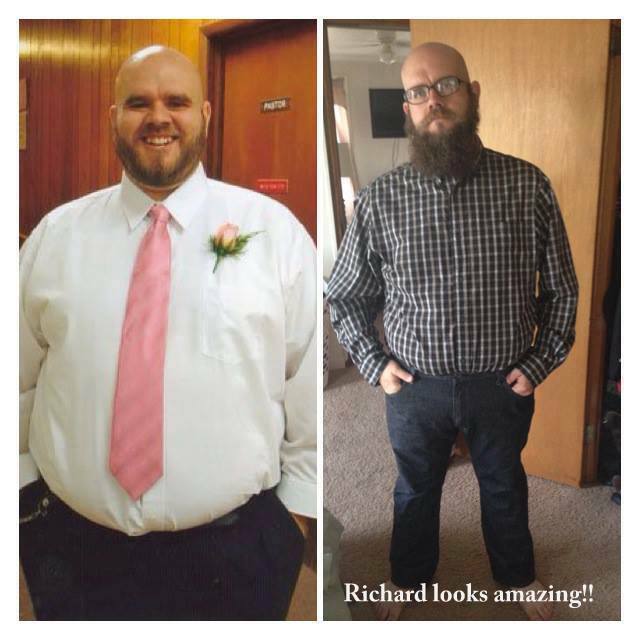 You inspire me and have really helped keep my path to better health a lot easier to navigate. I see on your amazon store that you have several types/brands of coconut flour, I remember reading a while back in a comment or something that some coconut flours don’t end up cooking the same. I need to replenish the coconut flour and wanted to get the coconut flour that will not alter the recipes from yours, do you have a favorite of the brands you reference in the amazon store? I crumbled up a leftover one of these to use as breadcrumbs in an oven-roasted burger patty. It was a great mix of sweet and savory. Delicious! I think my eggs were too cold, so when I was mixing in the coconut oil, I started getting lumps. (not little ones either) so I switched to my electric mixer, which has fluffed up the batter a lot (but got out the lumps for the most part). My doughnut pan is baking right now, and then I have a loaf pan full of the extra ready to bake immediately after. Man coconut flour is such a learning curve! Also, question… do you think making this with butter would work? coconut oil here in the UK is quite expensive and I can only get it in small quantities so I’m loath to use it too often. Grr looks like it deleted my post. So I’m sorry if this shows up twice. Question: Would butter work instead of coconut oil? Since moving to the UK I have discovered that coconut oil is sparse and quite expensive (so frustrating after having falling in love with it from living in the US) sadly it just hasn’t quite caught on yet over here enough for the price to lower. I think my doughnuts might be a fail (they are in the oven right now), as I think m eggs were too cold, and so it made quite a lot of lumps when I added the coconut oil. I switched to using my electric mixer to get rid of the lumps (it wasn’t just a few small ones, it was very big and most lumpy type lumps) which whipped up the batter a lot. Ended up with a lot more batter than I was expecting, so in addition to the doughnut pan, I’ve got the remainder batter prepped in a loaf pan. I really hope it turns out because it smells wonderful! Could you substitute egg beaters or egg whites for the eggs? Do you think it would turn out the same? made these today and they are awesome. 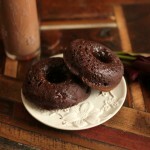 I topped some with sf chocolate glaze and chopped macadamia nuts and some with a sugar/stevia cinnamon sprinkle. Both were so good. I had no idea what i was missing. thank you thank you. I must have done something wrong… they taste awesome, nevertheless. Should I have melted the coconut oil? As I was mixing everything, it just stayed in a glob so I used my handheld mixer to combine everything. The recipe remained very runny with little bits of coconut oil floating around (I estimate it was going to fill my donut pans 2.5 times)… that was before almost catching my oven on fire! During baking, the donuts rose to a grand size! Then, some of the oil must have dripped onto the bottom of my (new) oven… smoke and panic! I pulled the donuts out and turned off the oven. The donuts fell. I still have to clean the oven. But, as I say, they taste amazing. No need for any topping. Do you have any suggestion for next time? Maria ? …. is tropical traditions coconut flour still your favorite ? AND…..who makes the coconut flour for nuts.com ? i need to buy more….. i want THE BEST ! Yep! I love tropical traditions! could you link the sugar free pancake syrup please :)! I love your recipes! I’m new to Swerve and wondering if you could explain something…if there are 5 carbs per tsp of Swerve, how are there not a lot more carbs in this recipe? Thank you!! You don’t count erythritol carbs. may i use xylitol sugar instead of swerve? Yes but it will add some calories and carbs. Hello – I only have Stevia on hand..could I sub Trivia for the Swerve? Same amount? Thank you! That is an OK option.